MIP investors can opt to receive dividends monthly or quarterly and like other mutual funds it also offers Growth and Dividend option. In growth option, the dividend is added back to NAV and in dividend option, it is paid back as income to investors. A MIP can also run on difficult phase, and may not declare dividend. A fund is allowed to declare dividends only when it has income. It cannot pay to investors from capital. MIPs are a better option than Fixed Deposit and Monthly income scheme (MIS) in terms of return as it offers a better percentage of return than the traditional ones. It is most suitable for the time period of 1 to 3 yrs who are looking for regular income with low risk. A fund that seeks to provide you regular income with an opportunity to grow your money through fixed income investments and a limited exposure to the equity markets. The asset allocation of the fund is 70-80% in debt and money market instrument (including securitised debt of maximum 50%) and 20-30% in the equity market. Investment in equity is done after analysis of business cycles, regulatory reforms, and competitive advantage of companies. The fund has given a return of 10.49% since inception and has outperformed both category and benchmark by a good margin of 3-6 percentage points over 1yr, 3yr and 5yr period. The scheme has been ranked 1st in CRISIL Dec 16 report for return and Debt-asset quality. The scheme’s primary objective is to generate regular return by investing in bonds and money market instrument and the secondary objective is to generate capital appreciation by investing a part in equity related securities. The scheme has been ranked 2nd by CRISIL in Dec 16 report for superior performance. The fund has exposure of 75% in debt and 25% in equity. Launched in January 2013, the fund has given a return of 11.53% and 3yr return is 14.04% against benchmark return of 10.45%. The fund has a diversified equity portfolio with the top pick of ICICI Bank, L&T, SBI, Infosys. A blend of growth and value style of investing, the scheme aims at to enhance returns over a portfolio of debt instruments with a moderate exposure in equity and equity related instruments. The scheme has been ranked 1st by CRISIL. The fund’s exposure to debt and equity is in the ratio of 80-20 ratio. The fund has given 15.06% of return in the last 1yr against the benchmark return of 10.48%. The fund’s portfolio consist of 57.88% of AAA & SOV instrument, 19.53% equity, 11.18% AA+, AA- instrument and 10.64% CBLO & term deposit. The fund is launched in March 2010, with an objective of generate regular income through investment in fixed income securities and allocating a certain percentage to Equities for capital appreciation. The fund primarily looks for generate return from its fixed income portfolio which is then invested in short/medium term high-quality instrument. The average maturity of portfolio tends to be in 3 years, gives an opportunity for capital appreciation in Fixed Income Portfolio. The fund invests in the select mid-cap portfolio of stocks. 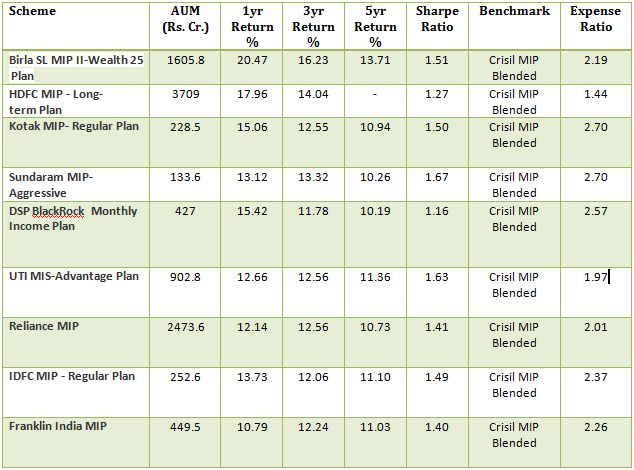 Trailing return for the fund in 1yr, 3yr & 5yr is 13.12%, 13.32% and 10.26%which is higher than category and benchmark. It is open-ended income scheme with an objective to provide regular income from a portfolio that is invested in predominantly high quality fixed income securities with a maximum exposure of 20% to equities. The fund is suited for moderate risk profile investors with a view of 1yr to 3yr period. The fund’s exposure in debt instrument is 77% and equity stands at 19.72%.Since inception (Sep 2000), the fund’s CAGR is 10.21% and in last 3 yrs, it has given 12.34%. The portfolio composition is Corporate Debt 24%, Equity 19.7%, Gilts 46.61%. The primary Investment objective of the scheme is to seek to generate income, consistent with prudent risk, from a portfolio which is substantially constituted of quality debt securities and to generate capital appreciation by investing a smaller portion of its corpus in equity and equity related securities of issuers domiciled in India. The fund’s equity exposure is at 24% investing in multi-cap and debt profile stands out at 73%. The debt portfolio consists of 35% Central Govt. Securities, Bonds & NCDs at 52.3% and CBLO at 12.3%. CAGR since inception(June 2004) is 10.07% and 3yr CAGR is 11.67%. The investment objective of the Scheme is to generate regular income through investments in fixed income securities and capital appreciation/dividend income through investment of a portion of net assets of the scheme in equity and equity related instruments so as to endeavor to make periodic income distribution to Unitholders. The fund’s return since launch is 10.19%. The portfolio consists of long-term debt fund at 46%, Equity at 25%, Govt Securities at 19% and rest in cash & cash equivalent. The fund has outperformed its benchmark in 1yr, 3yr and 5yr period by 2-4 percentage points. The fund focuses on to generate regular income in order to make regular dividend payments to unitholders and the secondary objective is the growth of capital. The MIP has given a return of 10.72% since launch. Exposure in Equity segment is 19.81%. It follows an investment style of Growth at Reasonable Price (GARP) on Muti cap portfolio with 50% of exposure in large cap. Debt portfolio consists of 25% Govt. Bonds and 48% corporate bond. IDFC MIP is a hybrid fund which offers up to 25% participation in the equity markets with the balance invested in fixed income. The Equity portfolio of the fund is an all-cap portfolio. The Fixed Income portfolio is a mix of high-quality debt and money market instruments. It has been ranked 3rd by CRISIL. The trailing return for 1yr, 3yr, and 5yr is 13.73%, 12.06% and 11.1% which all are ahead of the benchmark index. The List of the fund has arrived after comparison of different funds in terms of Return over a period of time, Credit Rating of Debt portfolio and Risk profile of the fund. ** – All the numbers are as of writing of this post i.e 3rd April 2017. ** – The funds are majorly chosen on past performance with the most weightage on the recent year performance.